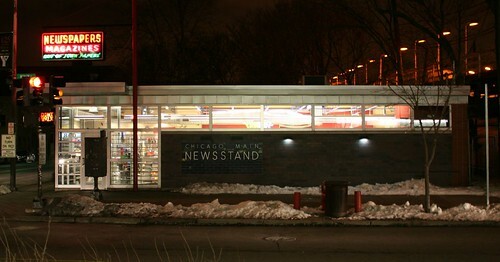 The Chicago Main Newsstand in Evanston is a real oddity, a little mutant of a Modern building. 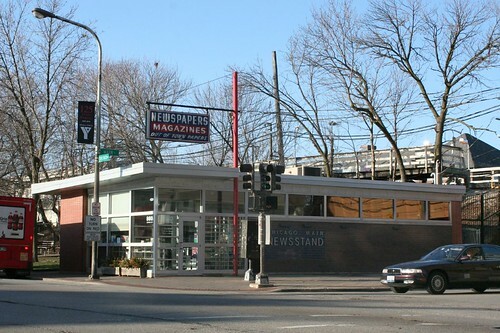 At first glimpse, it seems easy enough to suss out — it’s a classically Modern 1950s building, now and perhaps always functioning as a news stand, complete with a vintage neon sign on top, and thin sans-serif fonts announcing its purpose on the side. But it’s too perfect. There’s no sign of aging at all. Those thick window mullions are not very 1950s. And the interior uses varnished wood trim and exposed ductwork. No MidCentury architect would dare leave ductwork exposed, no more than they would walk out their front door without a pair of pants on. No, that interior, at the very least, is from the 1980s or later. Turns out, the stand originally went up in the 1940s. 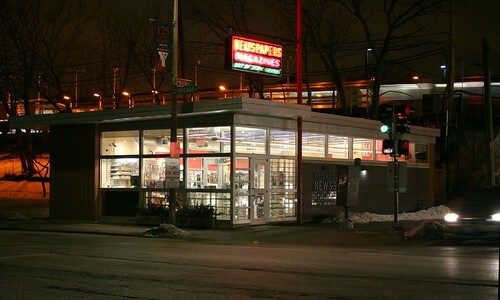 Named for the streets upon whose intersection it stands, the Chicago-Main Newsstand operated until 1993 as a mainstay of Chicago readers from across the region. After years of neglect following its closure, it came close to demolition in 2000, but was spared. In 2001, it re-opened after an intense renovation that included an entirely new roof and structure, relaying of the north and south walls, and the restoration of the original neon sign, which glows to the delight of sign fans across the city. 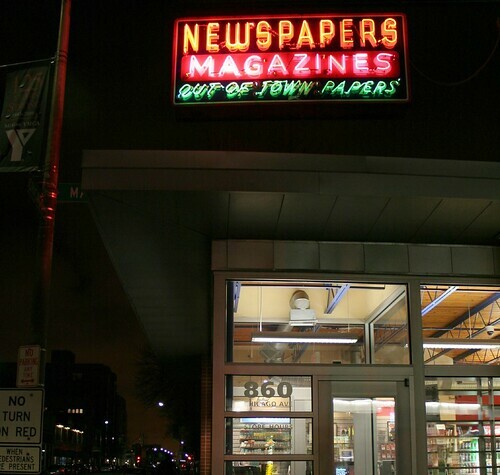 Today, the City Newsstand sells “60 newspapers and 6,000 magazines”, according to its web site. And it looks pretty cool, a beautiful modern box glowing in the night and gleaming in the day. This entry was posted in Pre-War Modernism. Bookmark the permalink. Anyone know the name of the architect? 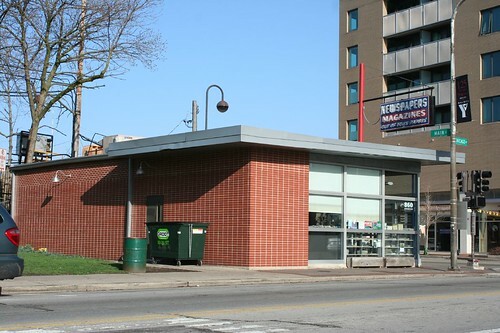 Love the addition of the clerestory windows, which were not part of the original design.